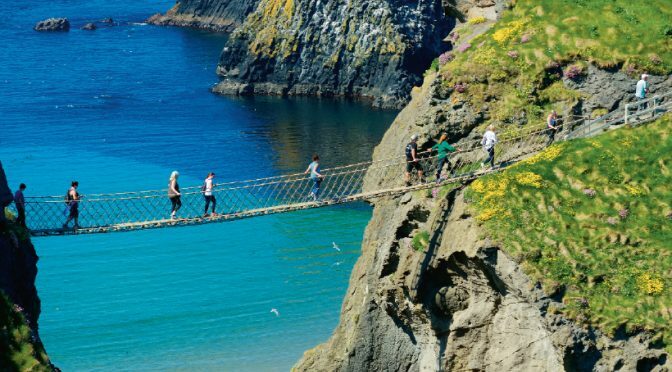 The words staring back at me from the picture read: ‘Carrick-a-Rede Rope Bridge, Northern Ireland’. It’s been hanging up on the same piece of cellotape for over a year. I tend to forget it’s there. The glare of the computer screen and the piling emails sadly take precedence. After he pointed it out, I sat staring at it for a while, obliged to show it some overdue TLC. The picture is of two grass-top cliffs side by side. A green-beige toupee covers the grey, jagged rock below it. As the caption suggests, a rickety rope bridge connects the two. Beneath it, a wash of blue and green; the Atlantic Ocean. It was 2016 when I purchased that print. It came from a little building that sat atop the very cliffs in the picture. I was near Ballintoy in County Antrim, Northern Ireland, about 30 miles from where my dad was born. We often visited as kids. It’s a fairly untouched place. The lady behind the counter told me there had been no real development within the village for decades. With only a few hundred residents living in the area — her being one of them — it was more of a tourist through-way. I took plenty of snaps of the Carrick-a-Rede Rope Bridge that day, but the lady’s chit chat was endearing. She was warm, genuine, so I didn’t want to leave empty handed. I asked her which picture I should take, and she recommended the one now hanging at my desk. It was a press junket that brought me there. A Game of Thrones tour. I’d been to the area a handful of times before. I was familiar with the spot, but not its claim to fame, so there was a sense of pride when I heard its beauty made the cut as a filming location for such a huge smash hit series. We didn’t make it across the rope bridge that day, but on the walk back to the seven-seater that was taxiing us around the country, I spotted a BBC broadcasting van. Shortly after, I was in it; the cameraman showing me all the ins and outs of being a travelling telly man. There were knobs and controls everywhere. The brisk Irish air, the wide, open ocean and a little intel on all things BBC. It was a good day. Flashback over, I replied to my colleague. “Urgh, don’t”, the ‘urgh’ reiterating my own confusion as to what I’m doing here, in the hot, hazy desert. His question came just a day after a friend, who hails from India, returned from a month-long stint in London (where I also used to live). “I don’t understand how you can live here,” she said, insinuating what I’ve left behind is far sweeter. The lush green parks, scenic train rides, crispy brown leaves covering parked cars, and the fad of seeing witty remarks scattered across chalkboards in the city. London has personality, she said. Even her encounters with the “fat, mutant squirrels” were long missed on her return to Dubai. As she continued to reminisce, she again queried why I don’t live there anymore. Staring back at my forgotten snap hanging from my desk partition, I asked myself the same question. What am I doing here? Dubai is perfectly fine. All-year sunshine, cafes, beaches and bars for as far as the eye can see. This place has a 24-hour buzz; a buzz that the sparsely populated Ballintoy in County Antrim will never have. But six years on, the buzz is fading. I find myself visiting the same spots. I rarely gasp in awe anymore; except at sunset (that never gets old). I came here for a new adventure, desperate to escape the perma-grey skies of the UK. The thought of experiencing life in a place which has no seasons was alluring. At the beginning, trips home to see the family were great, but I was always raring to get back to the desert. Today, it’s the opposite. I don’t like heading back. After 72 months of being away from the nest, homesickness has finally creeped up on me. Some long-term expats tell me the idea of returning home has become an alienating prospect for them. But I just can’t relate. This place has urban charm. The absurd convenience of calling my minimart late at night for some forgotten groceries has, I dare say it, made life at 33, easier than maybe it should be. But like a spoilt child, the complacency of an easy life has become unsatisfying. I want to go back to staring down my nemesis on the London Underground during rush hour while trying to vie for the only seat left in the carriage. Bring on the grey skies and rain. And when the milk does run out, let me wait till morning when civilisation awakes. I’m craving inconvenience again. Those questions broached to me earlier this week have forced me to face a reality that I’ve been questioning for more than a year now. But ironically, while all evidence points to someone who is desperate to head back to the motherland, something, and I don’t quite know what, compels me to stay a little longer.